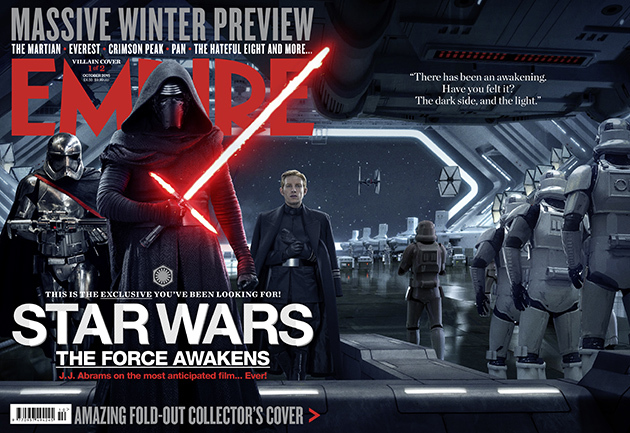 New EMPIRE cover shows off Star Wars: The Force Awakens First Order hanger! The next reveal will be on Sunday. Interestingly, this image is almost exactly the same as some concept art described here. The only difference was it featured Darth Vader standing in for Kylo and he had his back to us without Phasma and General Hux. Even the Original Trilogy Stormtroopers are the same (noticed by J-Red5). Didn’t think that one would get past you! All I can say about that is that the image was provided in its current form by Lucasfilm, after having been approved by the filmmakers.